A new era dawned on Saturday 15 August 1992 as the first Premier League season kicked off, and a successful competition began. The league, replacing the old First Division and originally known as the FA Premier League, consisted of 22 clubs. Manchester United ended a 26-year-wait for a top-flight crown and became the inaugural Premier League champions by a margin of 10 points. Leeds United were the defending league champions and Man Utd, who finished second the previous campaign, were on the receiving end of a landmark goal as they went down to a 2-1 defeat at Sheffield United on the opening day. Brian Deane scored the first Premier League goal with a header after five minutes. A host of big signings had a big impact on the opening weekend. Alan Shearer joined Blackburn Rovers, promoted via the Championship play-offs, from Southampton for a British record fee of £3.6million and scored two spectacular goals in a 3-3 draw at Crystal Palace. Mark Robins moved to Norwich City and got a brace as the Canaries stunned Arsenal 4-2 in their season opener. The first goal in a live televised match came courtesy of Teddy Sheringham, who rifled in the only strike in Nottingham Forest's win against Liverpool. Sheringham moved to Tottenham Hotspur later that month and went on to win the Golden Boot, netting a league-high 22 goals in 1992/93. Eric Cantona played a starring role in Leeds’ title triumph the previous season and continued his form at the start of this campaign, scoring the Premier League’s first hat-trick in Leeds' 5-0 thrashing of Spurs in August. On 26 November, the French striker surprisingly moved to Man Utd, who were nine points off the summit at the time of his arrival. Cantona's departure also coincided with a downturn in fortunes for Leeds, who failed to win an away match all season as they finished 17th. The early pacesetters were Norwich, who won 10 of their first 16 matches, with Arsenal, Blackburn and Aston Villa close behind. While Arsenal fell away, Norwich were top at the turn of the year while Blackburn and Villa stayed in touch. Blackburn were three points adrift of the Canaries at Boxing Day before an injury to Shearer, who had 16 goals in 21 Premier League outings, ruled him out for the season and led to them dropping out of the title running. Aston Villa, inspired by the summer signing of Dean Saunders as well as his fellow striker Dalian Atkinson, who scored BBC Match of the Day’s goal of the season with a wonderful solo effort against Wimbledon, were third going in to 1993. But Man Utd’s fortunes had been revived since a loss to Ron Atkinson’s side in November, and they were ahead of Villa on goal difference after 22 matches. Man Utd’s cause was helped by a stunning comeback at Sheffield Wednesday, when they fought back from 3-0 down to draw 3-3 at Hillsborough. United had also beaten Norwich 1-0 in December and, despite the Canaries being top at Christmas, that signalled a dip in form that allowed United and Villa to overtake them in January. Villa’s 5-1 rout of promoted Middlesbrough put them top on 17 January, after Alex Ferguson's team had reached the summit for the first time the previous week. 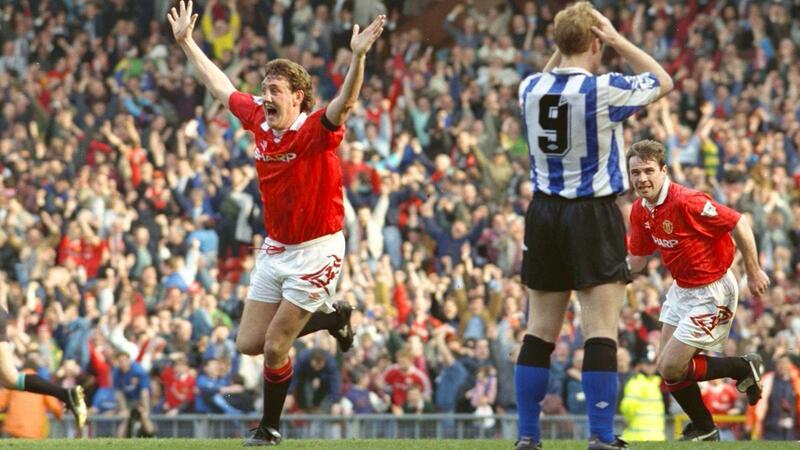 The lead predominantly exchanged hands between the two sides from here on but a crucial shift in momentum occurred on 10 April, when centre-back Steve Bruce scored two late goals, including a 97th-minute winner, as Man Utd came from behind to beat Sheffield Wednesday 2-1 at Old Trafford. Bruce's winner came on the same day Aston Villa slipped off top spot after a goalless draw at home to Coventry City. Ferguson's men stormed to the title from here on. The victory over Wednesday was the second of a seven-match winning streak until the end of the campaign. Villa lost their last three matches and Norwich won two of their final six outings. 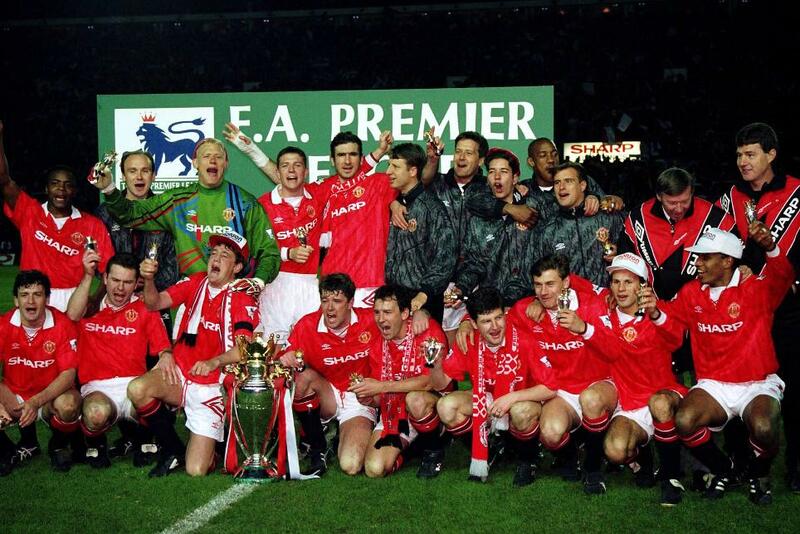 This allowed Man Utd to clinch the title at Old Trafford with a 3-1 win over Blackburn, which was sealed by a free-kick from centre-back Gary Pallister, who was urged forward with the clock ticking down and the title secured. United finished 10 points clear of Villa to win the first Premier League title. Norwich were a further two points back, while Blackburn and Queens Park Rangers, the highest-ranked London club, completed the top five. With the title race over, attentions turned to a dramatic battle against relegation on the final day. Nottingham Forest, bidding farewell to retiring manager Brian Clough, who had won back-to-back European Cups in an 18-year spell at the City Ground, finished bottom, while Middlesbrough’s relegation was confirmed before the finale. The third relegation spot went down to the wire. Oldham picked up wins over Aston Villa and Liverpool to leave them three points adrift of safety going into the final day, and they beat Southampton 4-3 to clinch survival at the expense of Crystal Palace, who went down on goal difference after a 3-0 loss at Arsenal in their final match.